They are committed to delivering high quality nutritional supplements, educating healthcare practitioners as to their optimal therapeutic use, and providing practice development solutions supportive to the healthcare practitioner. Now you can get pharmaceutical grade supplements from Dr. Collins' online dispensary at www.christinecollinsmd.ehealthpro.com! For her patients only, all orders are 25% off with code DRC25! Designs For Health is a professional supplement line, which means it requires a doctor's referral to obtain. All products in the line are GMP certified, which means the FDA regulates company facilities regularly and extensive lab testing is done on all the ingredients to ensure only the purest quality ends up in your supplements. Functional food powders are all FDA-approved. If you would like to get your product discounted…sign up to be a distributor and then tell your friends! $199 (only $6 more than being a customer and shipping will be free after the first time.) You will --get an automatic website to send people to so they can order and you will only pay $140 + tax as a distributor! Even if you don’t sell to others, you will earn back your sign-up fee after five orders. - Turn on auto ship. "Yes, this was me. After recent back surgery I have been unable to exercise and workout like I normally do. I was gaining body fat and I didn't like it one bit! I was getting a Dad-Bod and at age 55 I wasn't happy about it!! I was skeptical. My background as an M.D. made me question the validity of claims on the Testimonials page. In spite of there being THOUSANDS of stories of people feeling younger after using the gel, I just didn't think it would actually work for me. Boy was I wrong!!! The 1st night that I used it I slept so soundly that I actually slept through my alarm the next morning! This never happens! As an Emergency Medicine Physician I'm constantly doing night shifts and switching my circadian rhythms around. Sleep has always been a challenge for me since I started my career 26 years ago. Soon after I began the protocol I noticed that my focus improved as did my energy level. My libido is crazy #SorryNotSorry #YesISaidThat. My recovery time has definitely improved and I have much better moods as well. I seem to be handling the stress of work much better! (Not that it's ever been a problem, I just feel happier all around.) 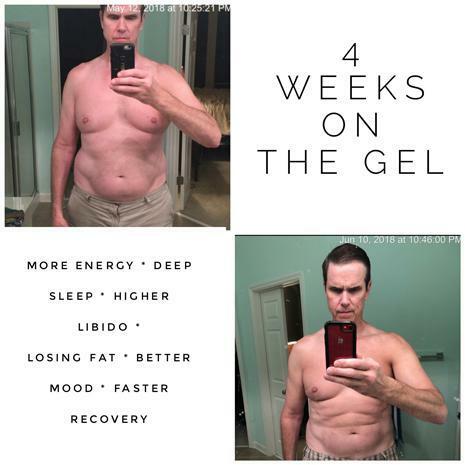 I do not own a scale so I can't tell you how many pounds I have lost but I can tell you that I am definitely losing body fat and the ONLY thing I have changed is using this gel twice per day over the last 30 days. 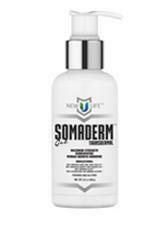 This gel is worth its weight in gold! Unfortunately, in my position at the hospital I am not allowed to share this with patients, as there are laws against doctors doing that. But if I had a private practice, I would recommend this to every single one of my patients!!! There's literally nobody who can't benefit from this in some way, shape, or form. This is a product that I never want to be without! I will use this for the rest of my life!!!"